Nickel Eclipse is a merging of personal and cultural history. Structured in part like the alternating colored beads on a wampum belt, patterns emerge from this exploration of contemporary life on an eastern Indian reservation and the sometimes tenuous persistence of a culture after centuries of survival within another, more dominant, culture. The poems, while highly personalized, reflect the tension of speakers surviving within-though never fully of-that larger culture, where lives are formed and meaning defined by their inherent separateness. 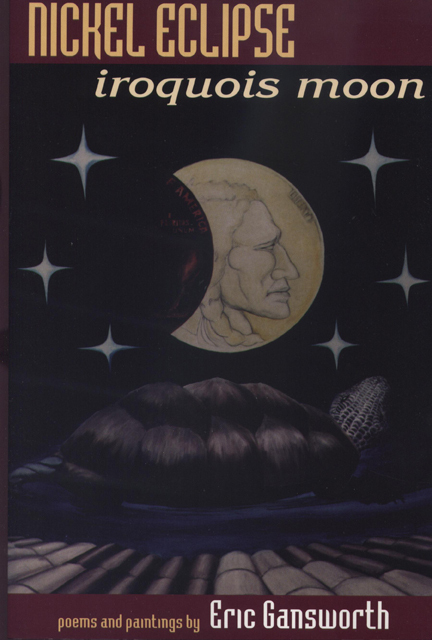 Gansworth's paintings complement the poems, using the metaphor of the cycle of moons identified in the traditional Haudenosaunee (Iroquois Confederacy) culture's calendar. These paintings of the different lunar phases serve to organize the poems around a common image, breaking them into sections through the use of an eclipse. Additionally, the relationships indigenous communities have had with the United States-from thriving to near extinction to eventual re- emergence-are symbolized in the progression of that eclipse across the moon. Symbols common to the culture appear throughout the cycles: the Three Sisters (Corn, Beans, and Squash), Strawberries, and Green Corn, from the ceremonies named for them, and more consistently, wampum beads-within which Haudenosaunee culture is iconographically documented-appear in various incarnations, from the earliest shell groupings, through isolated shaped beads, small strings, and full- belt formations. Eric Gansworth, an enrolled member of the Onondaga Nation, was born and raised at the Tuscarora Indian Nation in Western New York. He received a Bachelor of Arts and a Master of Arts in English from Buffalo State College. He is Professor of English and holds a position of Writer in Residence at Canisius College in Buffalo, New York. His previous work includes a novel, Indian Summers, and a collection of poetry, Nickel Eclipse: Iroquois Moon; numerous Native literature anthologies include his poetry and fiction. Eric is also an active artist and has painted the cover illustrations for a number of his books.